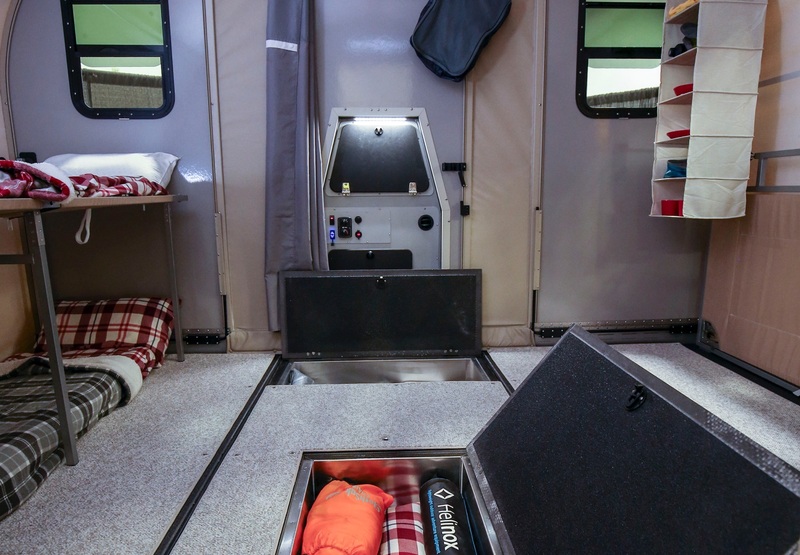 This year we’ve seen a trend in expandable portable accommodation with this expandable apartment that fits inside a van. This cozy cabin from Camp365 folds down into the 4ft space of a trailer, and expands to create 100 square foot of living space. 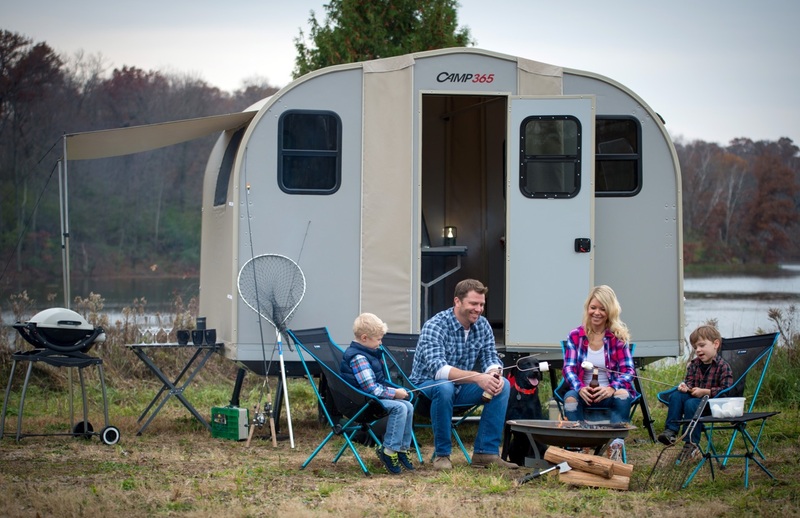 The Camp365 camper trailer is designed to be the ultimate outdoor adventure accessory, insulated for all weathers, towable even off-road, and big enough to sleep and entertain six people. Whether it’s a camping holiday, a hunting expedition or a long stint of ice fishing in the snow, Camp365 seems to have thought of everything. 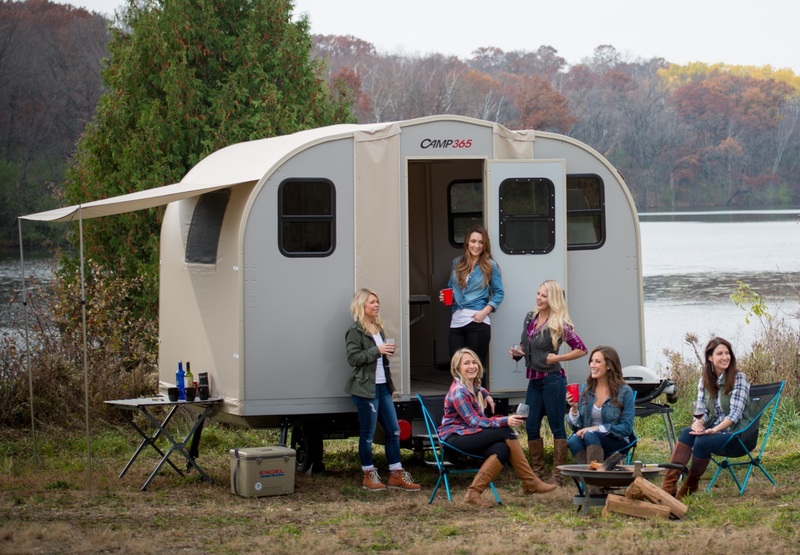 The Camp365 expands from 4ft to 100 square feet in less than 10 minutes. 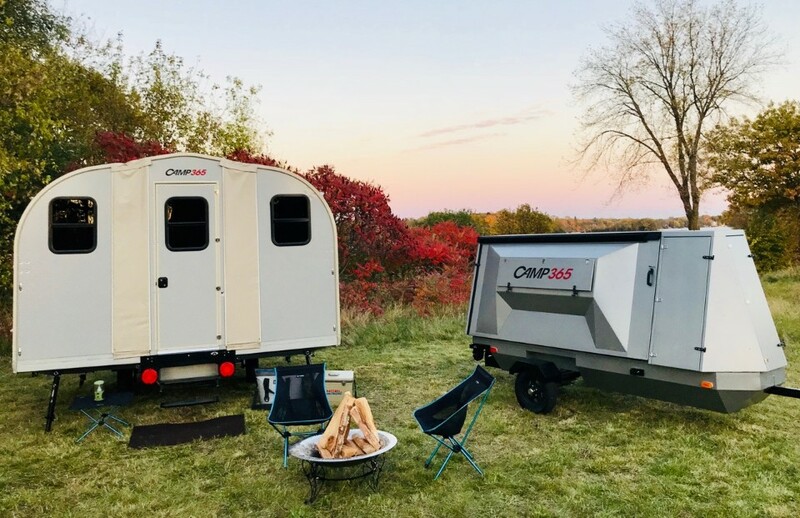 90 different prototypes and 110 months of testing through 10 cold winters has created the Camp365 trailer we see today, a 6ft7 by 4ft wide trailer mounted on a patented adjustable wheelbase designed to be towed across any kind of terrain. It’s narrow and aerodynamic, weighs just 1480lbs, and its axle can be adjusted from 71.5” wide to provide stability on-road down to 48” wide for when you want to go off-road. It’s made of reinforced steel with a powder-coated aluminum chassis and a lightweight aluminum alloy shell, and it really can go anywhere. With the optional 15” wheel kit and 14” wheels for added off-road ground clearance, attachable skis for driving over snow and ice, and seven-point variable leveling system, the trailer can be towed and set up on literally any terrain. But the all-terrain all-weather capabilities don’t stop there; with proprietary R7 insulation, hard wall composite insulation, and optional zip-liners, thermostat-controlled heating and hot water, it can be lived in during even the most frigid of conditions. On the flip side, it’s got electric AC, seven window cross-ventilation and thermostat-controlled cooling for those balmy summer days. The trailer is lightweight and made of long-lasting materials. 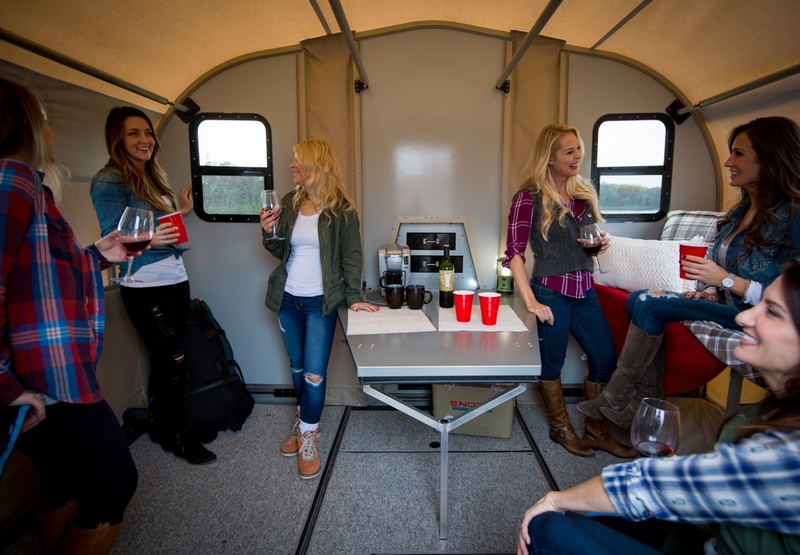 When unfolded, which reportedly takes less than 10 minutes, it provides 700 cubic feet of living space for up to six people. All of the materials used are designed to be long-lasting and weatherproof; the roof is made of marine grade material, the floor of EVA foam-based MarineMat and the windows of hardened tinted glass. Enter via the fold-out step and lockable front door and you’ll find all the mod cons and safety features you could ask for in a cabin. There’s LED lighting, 12V DC outlets, 110V AC outlets and USB charging. 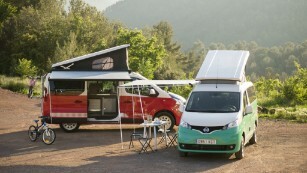 The trailer’s battery is recharged by the vehicle’s tow connection when hauling, and can be topped up with an optional Zamp solar kit containing a 90W fold-out solar panel with a 30Amp 125V solar charger, or by simply connecting to a city or campsite hook up. There are the options of a bluetooth speaker system, LED TV mount, and an energy efficient fridge/freezer mounted on a drawer for access inside or out. There’s a dual burner cooktop which slides out, and a fire extinguisher, smoke and CO2 detectors just in case. The Camp365’s interior, with the fridge, charging ports and four of the six beds visible. 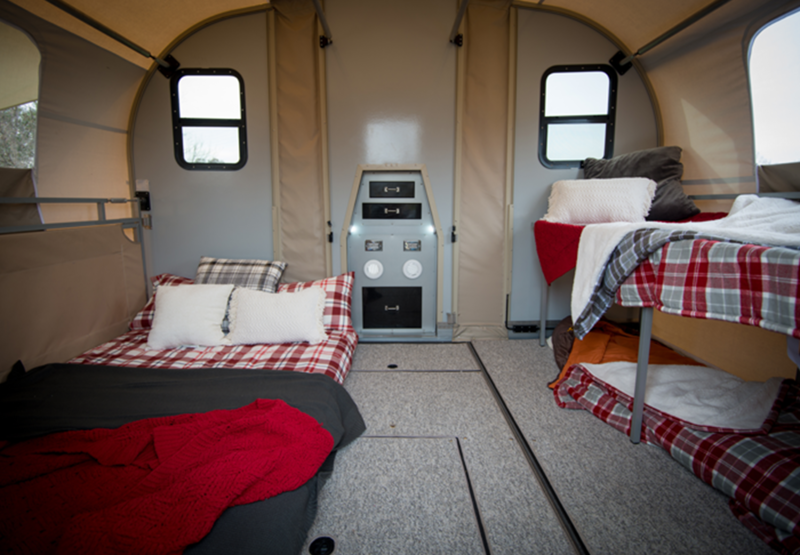 All of the plumbing in the Camp365 is optional and it comes with nothing as standard, but some of the things you can choose to add in include a Truma Combi 2.64 gallon propane water heater, a Truma VarioHeat 12,500 or 14,200 modular BTU propane heater, an outdoor shower system and interior/exterior toilet both with privacy curtains. 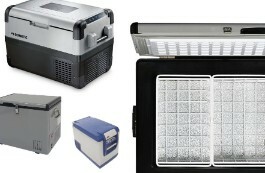 You’ll want to throw in a modular 5-20 gallon water tank too, and quite possibly a 15-gallon grey water tank, and if you want to swap the great outdoors for a city break for the night you can add in a city water connection too. Although it may be just big enough for entertaining, the Camp365 can sleep up to six people, two in a full-size double bed, two on bunk beds and two in another fold-out double bed, all of which are separated by a privacy curtain. 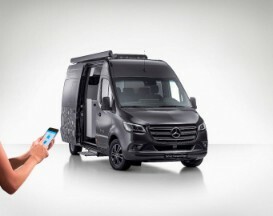 The rear hatch transforms into an interior table, and there’s plenty of storage to be found under the floor or using the optional portable shelving and full length hanging bars. Space for entertaining indoors as well as outside the cabin. Many of the Camp365’s gadgets are optional add-ons, and a few of those we haven’t mentioned yet include electric braking, propane mounts, a side carrier for bikes, kayaks or paddle boards, and an Aqualon rain and shade awning with sides. 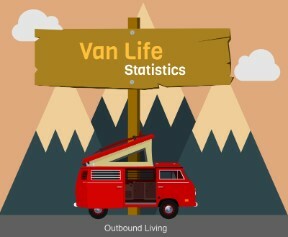 This means that the trailer is totally customizable based on your needs, without throwing in loads of extra gadgets and accessories you’ll probably never use. 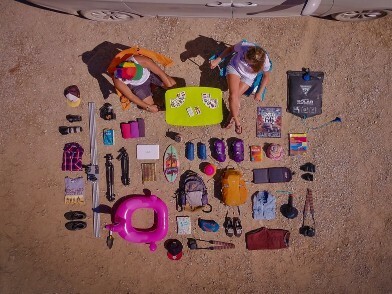 A surprising amount of hidden storage within the trailer’s floor. Currently available only in the U.S., the “world’s first foldable cabin” is currently retailing at $17,995 until the end of December, when it will go up to its normal retail price of $23,449.